With the advent of AI, health care is changing faster than ever. 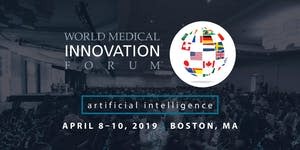 The 2019 World Medical Innovation Forum will bring together the CEOs, healthcare disrupters, and clinicians at the forefront of this change. As a promotional partner for WMIF, MassTLC is able to offer a 20% discount on the full conference ticket.